Look to Smith & Wesson's S.W.A.T watch for an easy-to-read timepiece that can withstand the rigors of law enforcement work. The scratch-resistant crystal face and stainless steel band withstands abrasions from everyday wear. Employing Japanese quartz precision movement, the analog watch features three hands for hours, minutes and seconds and includes a date display. The backlit face, emblazoned with the S.W.A.T. logo, illuminates the time even in low-light conditions or total darkness. The watch is water-resistant up to 90 feet, making it capable of withstanding environmental extremes and most tactical conditions. The watch comes with its own attractive, stainless steel case. 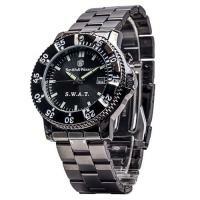 Day or night, whether on the clock or off, rely on the smart looks and rugged features of the S.W.A.T. watch.